HOW DO CHILDREN GET ALLERGIES? Genetic and environmental factors contribute to the development of allergies in children. GENETIC FACTORS In the UK an important genetic factor predisposing children to eczema, food allergies and allergic asthma (the allergic march) are mutations in the filaggrin (FLG) gene. Mutations can be inherited from either or both parents (Palmer et al. Nat Genet. 2005, Brown et al, JACI, 2011). 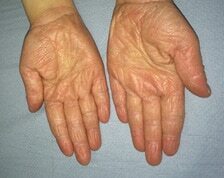 A tell tale sign that a patient has a FLG mutation is hand eczema with thickened skin and and palmar hyperlinearity. ENVIRONMENTAL FACTORS Evidence from the LEAP (Learning Early About Peanuts) and EAT (Enquiring About Tolerance) studies have shown that avoiding egg and peanut-containing weaning foods early in infancy (3 – 6 months) by children at risk of developing food allergies (whose with eczema or strong family history) can increase their risk of these allergy from 3% to 17%.